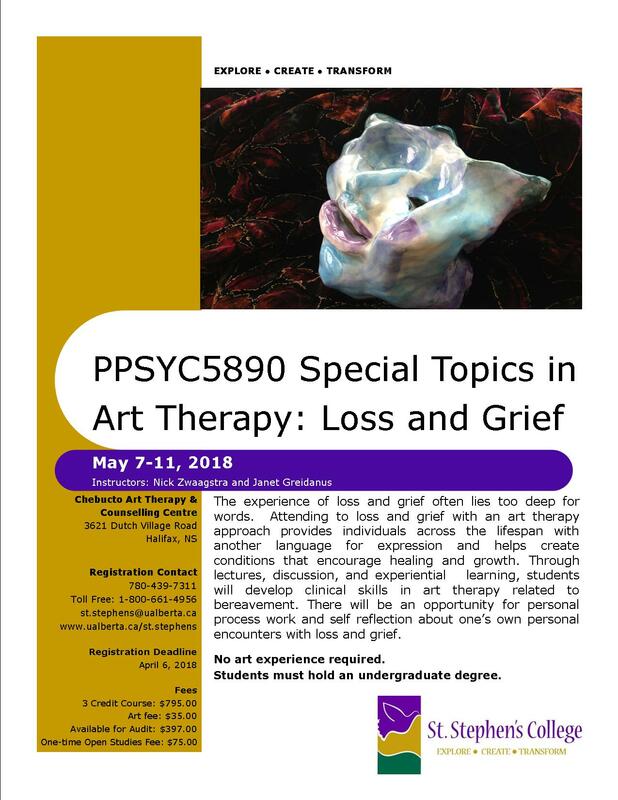 I will be co-teaching a course with Dr. Janet Greidanus, in Halifax this spring, “Special Topics in Art Therapy: Loss and Grief PPSYC55890. May 7-11, 2018. The experience of loss and grief often lies too deep for words. Attending to loss and grief with an art therapy approach provides individuals across the lifespan with another means for expression and helps create conditions that encourage healing and growth. This course will include lecture and discussion as well as experiential learning to assist in the development of clinical skills in art therapy related to bereavement. There will be an opportunity for personal process work and self-reflection about one’s own personal encounters with loss and grief. To understand how psychotherapy and art therapy can be utilised with clients who are grieving losses of many kinds. To learn various creative techniques that can be used in individual or group sessions when counselling the bereaved. To learn about the importance of context, various grief theories, including postmodern understandings of grief. To gain a basic understanding of developmental perspectives in bereavement, particularly for children & youth. To encourage self-examination and self-reflection about the student’s own loss and resiliency experiences.